YOU SHALL NOT PUT THE LORD, YOUR GOD, TO THE TEST. Our Lenten journey has begun. It is a journey of looking inward, one of fasting, prayer, and alms giving. It is a journey we take toward the Father, walking with Jesus, led by the Holy Spirit. In our first reading (Deuteronomy 25:4-10) Moses spoke to the Israelites at the end of their 40 years of wandering in the desert. He instituted the ancient harvest ritual of retelling the story of their ancestors' affliction and God's delivery from their slavery by the Egyptians. It was to be performed each year as part of the harvest festival. In many ways, we memorialize these same stories in our liturgies today. "Moses spoke to the people, saying: "The priest shall receive the basket from you and shall set it in front of the altar of the LORD, your God. Then you shall declare before the Lord, your God, 'My father was a wandering Aramean who went down to Egypt with a small household and lived there as an alien. But there he became a nation great, strong, and numerous. When the Egyptians maltreated and oppressed us, imposing hard labor upon us, we cried to the LORD, the God of our fathers, and he heard our cry and saw our affliction, our toil, and our oppression. He brought us out of Egypt with his strong hand and outstretched arm, with terrifying power, with signs and wonders; and bringing us into this country, he gave us this land flowing with milk and honey. Therefore, I have now brought you the firstfruits of the products of the soil which you, O LORD, have given me.' And having set them before the Lord, your God, you shall bow down in his presence." 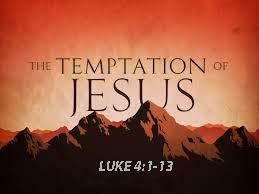 Our Gospel reading this Sunday (Luke 4:1-13) is the story of the temptation of Jesus in the desert, just before his public ministry. After a period of 40 days of prayer and fasting, Jesus was spiritually enriched but physically weak and hungry. And enter then the devil to tempt him in his time of weakness. Jesus' temptation and struggle were real but his triumph over the evil one is the perfection we all strive for and the example we follow. "Filled with the Holy Spirit, Jesus returned from the Jordan and was led by the Spirit into the desert for forty days, to be tempted by the devil. He ate nothing during those days, and when they were over he was hungry. The devil said to him, 'If you are the Son of God, command this stone to become bread.' Jesus answered him, 'It is written, One does not live on bread alone. Then he took him up and showed him all the kingdoms of the world in a single instant. The devil said to him, 'I shall give to you all this power and glory; for it has been handed over to me, and I may give it to whomever I wish. All this will be yours, if you worship me.' Jesus said to him in reply, 'It is written: You shall worship the Lord, your God, and him alone shall you serve. Then he led him to Jerusalem, made him stand on the parapet of the temple, and said to him, 'If you are the Son of God, throw yourself down from here, for it is written: He will command his angels concerning you, to guard you, and: With their hands they will support you, lest you dash your foot against a stone.' Jesus said to him in reply, 'It also says, You shall not put the Lord, your God, to the test. 'When the devil had finished every temptation, he departed from him for a time." In our Epistle reading (Romans 10:8-13), Saint Paul instructs us that salvation is a two-part process. It is a process of the believing in our heart and of confessing with our mouth. Both are necessary. "Brothers and sisters: What does Scripture say? The word is near you, in your mouth and in your heart --that is, the word of faith that we preach -, for, if you confess with your mouth that Jesus is Lord and believe in your heart that God raised him from the dead, you will be saved. For one believes with the heart and so is justified, and one confesses with the mouth and so is saved. For the Scripture says, No one who believes in him will be put to shame. For there is no distinction between Jew and Greek; the same Lord is Lord of all, enriching all who call upon him. For 'everyone who calls on the name of the Lord will be saved.'" May we use these 40 days as an opportunity to deepen our relationship with Jesus and nourish our hearts.